It’s a pretty kewl concept and is great for someone like me who’s on the go a lot. What’s nice is you can charge both your device and the extra battery pack at the same time. The downfall for me is it’s a dongle style attachment. They make the iPhone too long for me when attached. That’s why I love my Mophie Juice Pack because it slides up behind the iPhone and doesn’t feel like I’m going to break it off like a dongle style does. 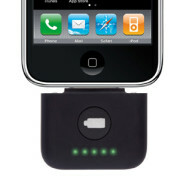 Incase has an even slimmer style battery called the Power Slider Battery. Both cost much more than Griffin’s PowerBlock Reserve which is just $39.99 while the others are $79.99 and $99.99. Check out the full press release after the photo gallery. 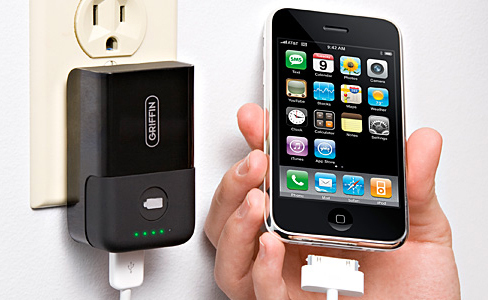 NASHVILLE, TN – May 12, 2009 -Griffin Technology Inc., creator of all things iPod and iPhone, today announced the availability of both the PowerBlock Reserve and PowerJolt Reserve. Also available is PowerDuo Reserve, a bundle packaging of both PowerBlock Reserve and PowerJolt Reserve. These products offer the reliability of Griffin’s popular power solutions with the added feature of a detachable battery pack. 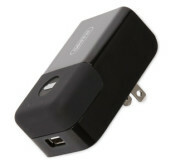 PowerBlock Reserve and PowerJolt Reserve charge any USB-rechargeable device, including iPhone, iPod and most MP3 players. PowerBlock Reserve is an AC charger with a detachable, rechargeable battery pack; PowerJolt Reserve plugs directly into the car’s cigarette lighter or 12 V DC power outlet and also features a portable battery. Users with a need for both home and car solutions may purchase PowerDuo Reserve, a bundle packaging that contains both PowerBlock Reserve and PowerJolt Reserve at a price lower than purchasing both independently. The detachable battery for each product, Griffin Reserve Battery Pack, is rechargeable and snaps easily into the dock connector of the iPod or iPhone. For added play time and convenience, the Reserve Battery Pack is interchangeable between PowerBlock Reserve and PowerJolt Reserve for easy recharging on the go. Individually packaged Reserve battery packs will soon be available for purchase directly from Griffin Technology. Griffin’s PowerBlock Reserve and PowerJolt Reserve are each $39.99, and PowerDuo Reserve is $59.99. PowerJolt Reserve and PowerDuo Reserve are now shipping and available through Apple; all models in Griffin’s Reserve product line are coming soon to www.griffintechnology.com and other major retailers nationwide. this is very nice. I wish I had the money. I would definetlntly get that charger. If it came with another USB cable for the iPhone and was $29.99 I’d be all over it. I read this post fully about the comparison of hottest and previous technologies, it’s remarkable article.